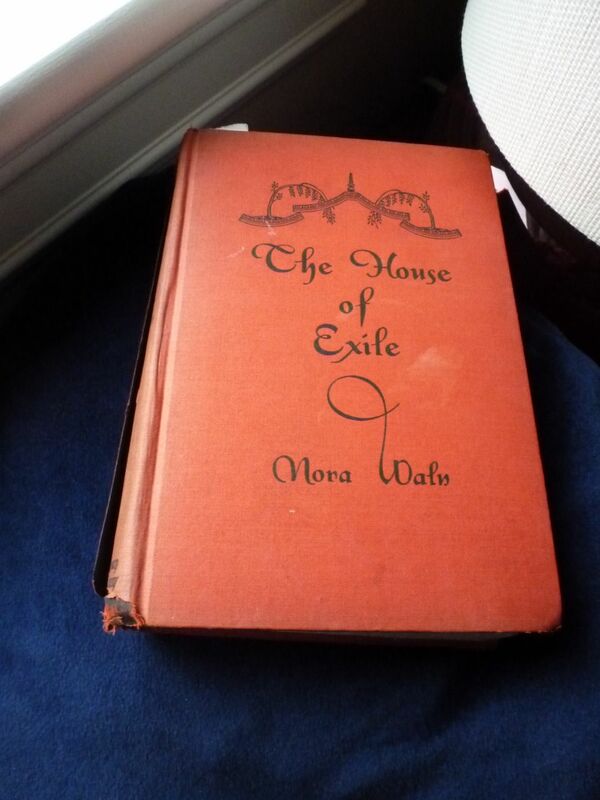 A few years ago, my maternal grandparents gave me a book called The House of Exile by Nora Waln. I flipped through it briefly, but with college papers and readings calling, I stuck it in my bookshelf and forgot about it. When I got back from Nepal, I was sorting through my room and found it again. It’s an old book, written in the 1920’s by a woman who lived in China when she was a young adult. She moved there after receiving an invitation from a Chinese family and stayed for about 12 years. As I started to read the book again, I remember why I had put it down in the first place. It’s a very slow read. She describes her life in China with extreme detail. To someone who knows a lot about China or to someone who is very interested in learning about China, I imagine the book could be captivating, but for me, it’s been a bit boring. From the moment of my arrival…it was as though, like Alice, I had stepped through a looking-glass into another world. The world I left behind became a dim, fantastic dream. Only this in which I entered seemed real (30). This really rang true. I remember being in Nepal and feeling like the U.S. was so far away, a different world, a different time. Sometimes I’d stop and think about where I was and just wonder in amazement at how different my life had become. This feeling became even more intense when I remembered that only a few years ago, I knew almost nothing about Nepal and didn’t speak a word of Nepali. [She] wanted to dye [my] hair black, as it is the color of the yellow gentian of misfortune. But Shun-ko reminded her that yellow is also the color of the innermost petals of the sacred lotus (40). This part made me laugh. I’ve had so many people tell me that I should dye my hair black, not because blond/yellow is considered the color of misfortune in Nepal, but just so that I would look more Nepali. I still haven’t dyed it black, although I did go through a period in high school and college where it was pink. Now-a-days, though, my dirty blond hair has grown on me, and it’s here to stay. Something that was missing from this book was a sense of her reactions to and inner thoughts about her new life. I admit that I haven’t read the whole thing, so maybe she goes in that direction at some point in the book, but in the beginning, where she describes her first days, weeks, and months in China, she doesn’t. This makes the book read like a little like a list of events, rather than an intimate description of her life in China. One thing that I wish she had elaborated more on was the process that she went through to learn Chinese. At one point, her hosts dress her up in fancy clothing and she goes to meet some of the important ladies in the extended family. After being unable to speak Chinese in front of them, one of them commands her to learn the language. Nora says, “I was not to be presented to audience again until I was sufficiently civilized to hear and to speak for myself” (51). Eventually, however, my ear, my brain, and my tongue were sufficiently well versed for Shun-ko to present me…(51). This is all she writes about her language learning. But I want to know how she learned it, how she felt about being immersed in a new language. Did she have low points and frustrations? Was she as impatient as I was? Although I didn’t find her storytelling as rich as I hoped it would be, one thing I really loved about the book was the connection and intimacy that she has with the women of the household she lives in. They take her in, find her a place to stay in their already crowded home, teach her how to dress like a Chinese woman would, and take her to get her horoscope read. They tease and joke with her too. Nora’s strong connections with the women of the family is something I could really relate to. Both while I was studying abroad and while I was living there this year, it was the women in Nepal who I had the closest relationships with. It was women who both loved and judged me, took me in like their own, told me secrets, cared for me, and scolded me when I did things wrong. There are definitely interesting tidbits and quotes that pop out while reading The House of Exile, and there’s whole section towards the end of the book about the changing political climate in China at that time, which I’m interested in reading. However, I wanted Nora to go deeper and describe more of her reactions to China. Without being able to understand her feelings towards living abroad, it was hard for me to relate to more of her story.